Regardless of whether we are in summer, winter, low or high season, the price of tickets AVE Tarragona Madrid on Trenes.com is between 31,05 € and 137,70 €. We have improved to the maximum the search for the cheapest journeys by AVE Tarragona Madrid, so that our users do not have to check one to one all the options, in a brief moment, we present on your screen only the cheapest fares and tickets for AVE Tarragona Madrid , what is more, we are going to tell you how is the cheapest journey to travel on the AVE Tarragona Madrid. The best AVE tickets Tarragona Madrid, be it a planned trip or a last minute break, we have them. Equally, for the return, AVE Madrid Tarragona. What you usually worry about, the price, is of 31,05 €, and you are travelling in Turista class, you must be about 15 minutes before the departure at 13:22 h, so as not to miss the AVE Tarragona - Madrid that leaves at that time, and we talk about this hour because it is the cheapest of all that there are, which are comprised between 6:38 h and 21:33 h. A good trip starts with the best tickets for AVE Tarragona Madrid. You can check the timetables for AVE from Tarragona to Madrid on AVE schedules Tarragona to Madrid. This journey by AVE Tarragona - Madrid is of 2 hours 37 minutes, since we leave from Tarragona at 13:22 h and until we arrive at 15:45 h at Madrid. Discover the AVE tickets Tarragona Madrid from 31,05 €. The search for the AVE train ticket from Tarragona to Madrid for the best price was made on the 11/04/2019 a las 12:36 h, it is a AVE-TGV train with departure on the 24/04/2019 a las 13:22 h and arrival on the 24/04/2019 a las 15:45 h. The price of the cheapest ticket has been 31,05 € and the cheapest rate possible for this ticket has been the Promo fare. Trenes.com issues official AVE Tarragona Madrid tickets and it does totally legally as a verified and authorised travel agency by Renfe, ie if you buy a AVE Tarragona Madrid ticket through our website, you only need to print the ticket or to show the bidi code sent to the mobile phone, present it at the Camp De Tarragona station and get on the train you have got assigned. This is a real example of a Tarragona Madrid ticket issued by Trenes.com. On it you can see the ticket number 7546000624322, the locator AFPKJ8, the origin and destination stations, in this case the train travels from Camp De Tarragona to Madrid Atocha. The railway operator Renfe, the train type AVE, the train number 03062 and the rail car 005. 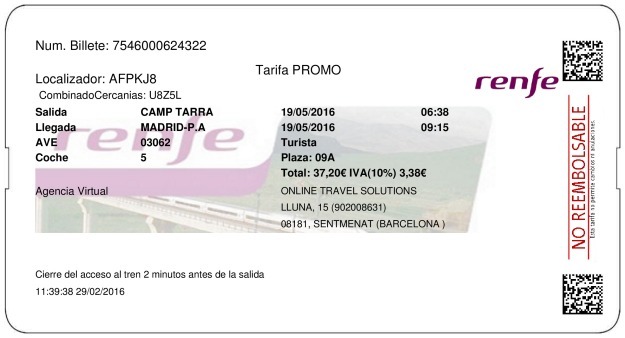 The contracted rate Promo in Turista class, the assigned seat 09A, the price for the ticket, this Tarragona Madrid train ticket is not necessarily the cheapest ticket since the price of the train ticket often depends on the time in advance with which you bought the ticket. In this case the price is 37,20€ and the departure date is 19/05/2016. The train departure time of this ticket is at 06:38 h and the arrival of this train at the Madrid Atocha station is at 09:15 h. The duration of the journey from Camp De Tarragona to Madrid Atocha has been 2 horas 37 minutos. And so, we have in front of us the cheapest journey by AVE from Tarragona until Madrid among the thousands of possible combinations, that if we had to look for them one by one, we would spend an enormous amount of time, however, with our search engine for cheap seats in the AVE Tarragona Madrid, the saving is double, because we save search time and we save money. The energy consumption of the AVE is much more efficient than the one of cars or aeroplanes. If you also want to save time on the journey from Tarragona until you reach Madrid, we can also tell you how, based on the fact that in any case the estimated times of travel during 423 Km at high speed, are between 2 hours 4 minutes and 2 hours 37 minutes. The first AVE journey in Spain was from Madrid to Seville, and after this connection, many Spanish cities are connected, you will find here the best prices on your AVE tickets. Both durations are more than acceptable times to advance 423 Km without having to make any effort, but if we need the trip by AVE Tarragona - Madrid to be as fast as possible, we have some trick for it, the point is, we have to leave from Tarragona at 7:57 h, because it is at this departure time when the AVE will transfer us faster to Madrid, exactly we will be in our desired destination at 10:01 h, with the freedom of not having to wait any second longer to start to enjoy our stay in Madrid. Travelling by AVE from Tarragona to Madrid means bringing two cities closer, as the travel time is reduced to 2 hours 4 minutes. Since the appearance of the AVE, it is possible to travel throughout Spain in such amazing durations that you wouldnt believe it if you were told in the past. 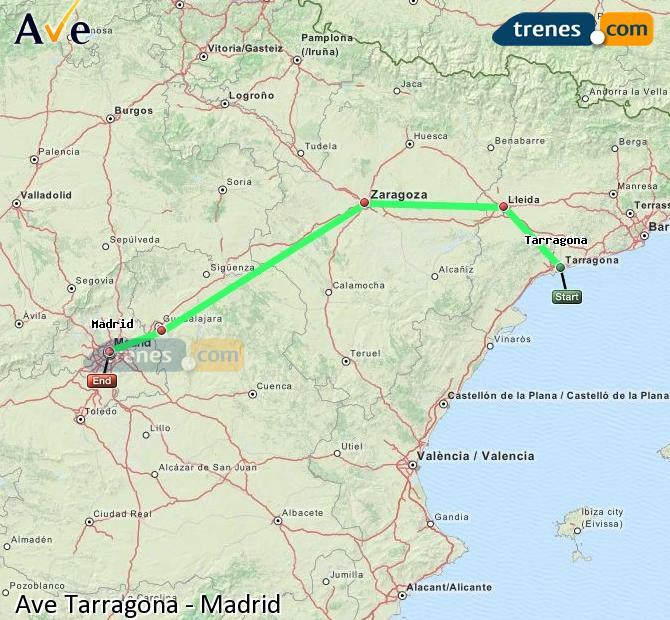 Now we can travel from Tarragona to Madrid, the capital of Spain, in about 2 hours and 27 minutes. The distance that separates Madrid from Tarragona is of 423 km and the average speed of the AVE, 172 km/h. The high-speed train will leave Camp de Tarragona and will make its arrival in Madrid Puerta de Atocha. The station of Atocha is a station that is always in movement because it has a very active railway activity. The stretch between Madrid and Tarragona was not put into operation until 2006, within the Madrid, Zaragoza, Barcelona and French border, in which Tarragona is an intermediate stop. This line is one of the busiest one in Spain, linking two of the most important cities, Madrid and Barcelona. 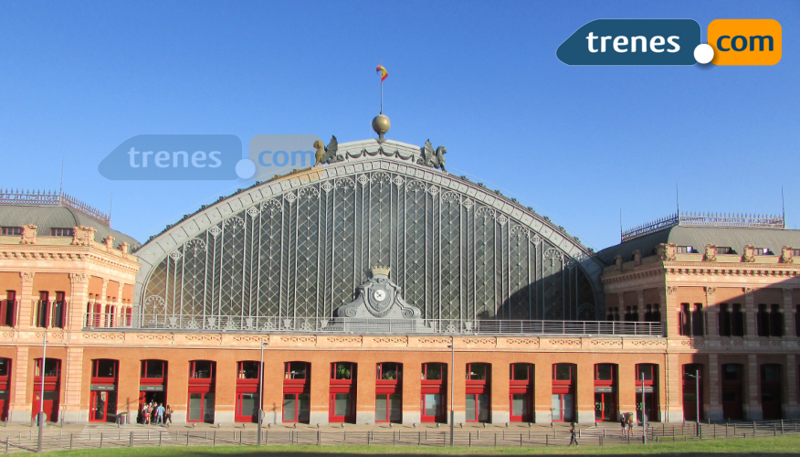 Madrid Atocha station has a perfect location, because you are in a few minutes in the centre of the capital from there. The station is divided into two: Madrid Puerta de Atocha and Atocha Cercanías. In addition, there is also a bus service, a metro line and taxi service. There is also a car rental service at the station. Madrid is a very interesting city for several reasons, reasons why it receives so many annual visits.